Hi all! Sorry for the lack in new posts. I’ve had a busy past several months. We sold and bought houses, moved, did multiple projects at the new house and had an accident at work that left me with 6 broken ribs, 4 fractured vertebrae and a concussion to top it all off. All that said, I have been tinkering a little on some computer geekery. This really has very little to do with FreeNAS, but I ran across a great little project for running your own CalDAV / CardDAV server. 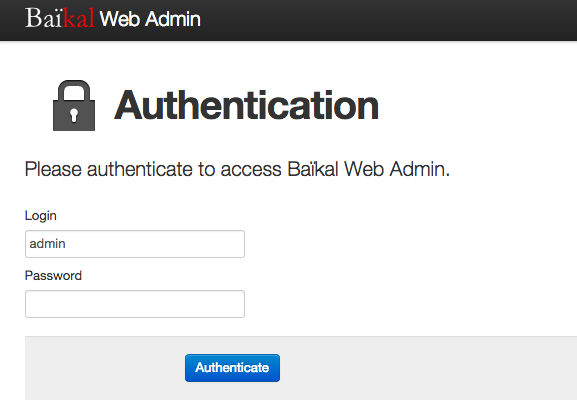 The project is called Baikal and can be found here http://baikal-server.com/ . I’ve been looking for something like this to share contacts with my wife for a long time. I first tried OwnCloud, but the way it integrates with Apple’s AddressBook is clunky, with many card imports getting missed and even a few crashes of the AddressBook App. I’ve had Baikal up and running for a few days now, and so far, it has been working great. What I haven’t exactly figured out yet, maybe because it isn’t an option yet, is how to share contacts between users. So for the time being, both my wife and I are using the same login. So, now for the FreeNAS part of this. I am running the Baikal server on my FreeNAS box in a jail. Install was really easy, especially because I already had a jail up and running with a webserver installed. 1. Open a terminal either through the GUI or ssh and connect to the server. You’ll want to replace 1 in the next line with the corresponding JID for the jail you want from the above output. 4. Update the ports tree. 6. Change the ownership on the baikal directory…this will depend a little on your setup, apache defaults to using www. Then move it somewhere a little more useful. 8. Restart apache and see if it works. 9. Test to see if things are running right. Go to the URL you used in the above apache config. You should see the following if everything is working. 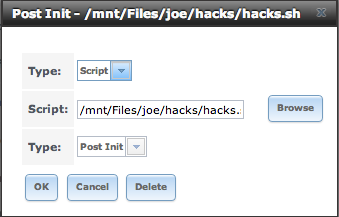 Log in with the admin credentials you just created, then create at least one user. Some closing notes, there are multiple ways to setup the webserver to make this go. I’d recommend setting it up with ssl enabled. That is a more complicated process and I haven’t the time nor desire to outline it here. Also, it seems that Baikal really doesn’t like being setup in a way where it is not the docroot. So for instance, it is happy to be at http://somewebsite.com , but it will break when connecting your addressbook to it if it is located at http://somewebsite.com/cards. Maybe it just doesn’t like being aliased, not sure exactly, but it sure wasn’t happy with me for a while. Seems like FreeNas 9.2.0 and earlier shipped with ntpd enabled and listening for monitoring requests. Recently got a notice that one of my machines was part of a DDoS attack on port 123 (NTP). It was a NTP reflection attack and my freenas box was responding to the requests. I should say, this will only affect you if your FreeNas box is internet facing or if you have port 123 forwarded to it. You should get a no connection error…or something like that. That should do it. Your other option is to upgrade to 9.2.1 or higher. Wondering if there is more interest in a writeup on setting up owncloud on FreeNAS 9.2.1 or if you’d rather have a writeup on setting up CrashPlan on FreeNAS 9.2.1? I have owncloud working, so that would be the easier one. CrashPlan is a difficult little bugger, so that will take some more work. Or maybe there is something else entirely. Vote it up and we’ll see what happens. 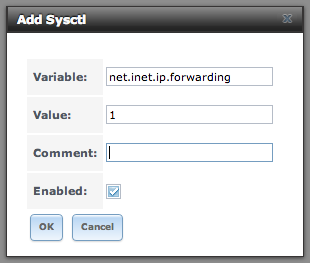 Back in July of 2012 I posted a write up on how to get OpenVPN running on FreeNas 8.2. That write up was really just notes to myself and I never really thought it would get much attention. Over the last year, it has seen enough traffic that I thought it deserved a re-write to try and make it easier to follow. So, here goes. As always, if you find this super useful, I wouldn’t turn down paypal donations. If you don’t have a static ip address, lets start by setting up a Dynamic DNS entry. There are several service providers that offer free dynamicDNS service…currently FreeNas supports: dyndns.org, freedns.afraid.org, zoneedit.com, no-ip.com, easydns.com and 3322.org. 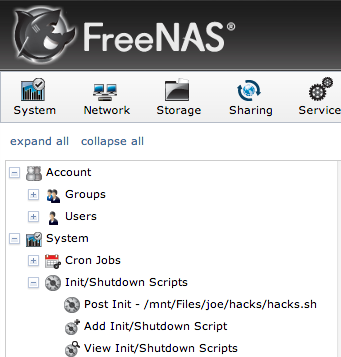 So, pick one, set up an account, configure your FreeNas gui to use it in the services panel and then come back. Next you’ll need to forward UDP port 1194 on your router to your FreeNAS box. You’ll need to do a little google searching if you don’t know how to do that on your specific router. Generally it involves logging into the web interface on the router, going to the advanced section and looking for something that sounds like port forwarding. You can configure OpenVPN for password authorization, but I really don’t like that method. So I’ll tell you how to set it up with certificate authorization. Easy-RSA is included in FreeNas 9.1 and later. You can find it here: /usr/local/share/easy-rsa . If you don’t want to download my sample files or if you don’t trust me, then you should skip step 2 below and use the Easy-RSA files at /usr/local/share/easy-rsa and then also create your config files from scratch. 2. Now, download my openvpn.tar into the root of your data drive, so for me /mnt/Files. Your output from ./build-ca should look like this. Answer the questions with the appropriate answers. 4. Now, we want to create a server key. Your output from ./build-key-server should look like this. Answer the questions with the appropriate answers. 6. Now we might as well generate a client key. 7. Now we can get out of the sh shell and move the keys and certificates into their place. The reason we want the keys and config file on the data drive instead of the OS drive is FreeNas upgrades will wipe out our OpenVPN setup if we have everything installed on the OS drive. 1. Next we can create the openvpn.conf config file and edit it for our specific setup. If you didn’t download the openvpn.tar file from me, then you will need to create a openvpn.conf file from scratch. If you did download the openvpn.tar file, I’ve included a couple of Bare Bones sample configs. We need to make a few changes to match our specific needs. hit the ESC key, then type :wq to save and quit out of vi. 2. Now lets add a few things to rc.conf so we can start openvpn. We also need to make these same changes to /conf/base/etc/rc.conf so they survive a restart. 1. Now we should be able to start the OpenVPN server. 1. Copy your client key(s), client crt(s) and ca.crt to the client computer you will be using to connect to the server. There are a bunch of ways you could do this, I just copied them to a shared folder on my FreeNas box and moved them from there onto my client computer. You need to change the line remote something.dyndns.org 1194 to either your public static ip of your router or a dynamic or static domain name. You also need to change the ca, cert and key lines to the path of where those files will live on the client. With all of that, you should be good to go. I’ve tried to be as clear and accurate as possible. I hope you all enjoy the rewrite. Also, if you want to add an additional layer of security, check out my guide on getting OpenVPN working with Google Authenticator. As always, donations are welcome via paypal.